Here's Activity Village's collection of rainbow colouring pages - make sure you colour them in the brightest, prettiest colours! Whoops! Unfortunately we seem to have lost two of our three printables in the move to this new site! We hope to find them and return them soon. This rainbow colouring page labels the colours the children need for each "band" of the rainbow. Fun for younger kids! Here's a lovely simple colouring page of a rainbow for younger children to colour in. Remember, Richard Of York Gave Battle In Vain - or Red, Orange, Green, Blue, Indigo, Violet! Here's a simple rainbow colouring scene for the kids to colour in, ready to print. 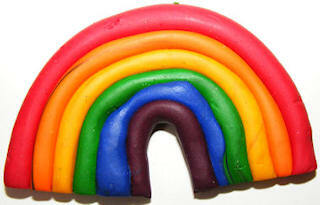 Here's a simple colouring page of a rainbow to the kids to print and enjoy. This fun rainbow colouring page would work well for a weather topic, and with simple outlines it is easy to cut out too. Younger kids will love tracing carefully over the many lines in this fun sun and rainbow tracing page - and of course there are clouds as well! Colour the picture in when done.